A few weeks ago, I finally had time to scan an assortment of early Amtrak promotional photographs showing car interiors and exteriors, as well as “beauty shots” of trains traveling through varied landscapes. Early in Amtrak’s history, these photos were distributed to news outlets so they would have stock images available to run with Amtrak-related stories. Following refurbishment, Amtrak described this car as a "ranch-dorm" due to its Western decor. Since many of the photos are unlabeled or simply have a brief note scrawled on the reverse—such as “coach” or “lower level dome,” it’s quite valuable to discover published works that include the images along with detailed captions. One such recent find was Amtrak Trains & Travel by Patrick Dorin. 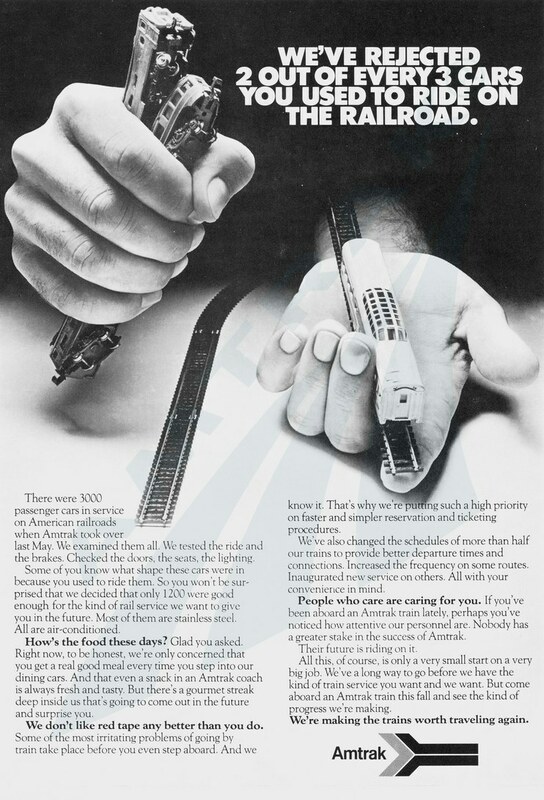 Published in 1979, it made extensive use of promotional photos to highlight contemporary rail travel, particularly the types of accommodations and equipment provided by Amtrak. Books like Dorin’s served a useful purpose in the company’s first decade since the initial fleet was made up of a variety of cars and locomotives purchased and leased from the predecessor railroads. Rail fans know these early years as the “Rainbow Era” for the colorful, mix-matched equipment found on trains. In preparation for the start of service in May 1971, Amtrak handpicked approximately 1,200 cars from a total pool of 3,000 held by the two dozen railroads that had been relieved of their passenger service obligations. In addition to much-used coaches, Amtrak bought 90 dome cars, 50 lounge cars and 140 dining cars. 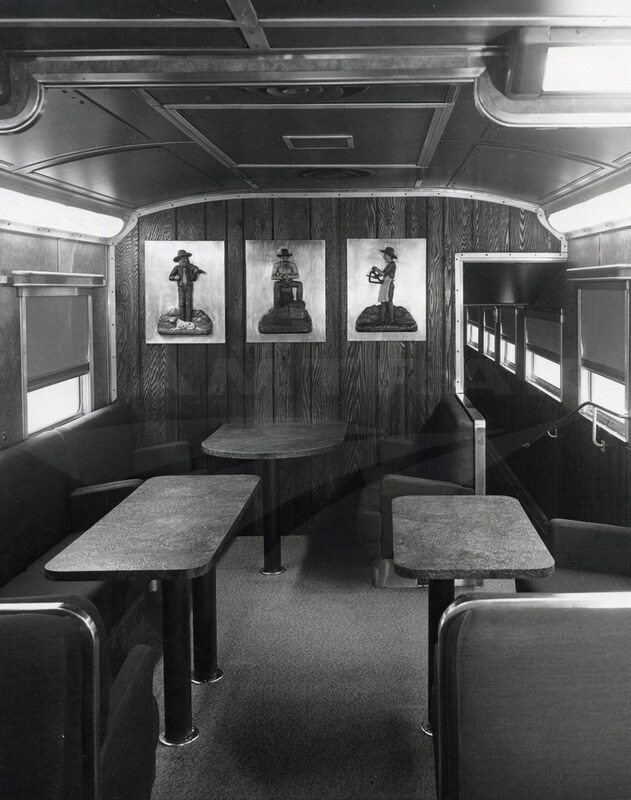 One photo from the collection that drew my attention appeared to show a lounge car with a western theme; three panels on the back wall depict a musician, man peeling potatoes and a cook. Flipping through Dorin’s book, the photo also makes an appearance under the section about lounge cars. Between the information in Amtrak Trains & Travel and typed notes on the photograph describing it as a “ranch-dorm car,” I could begin to piece together the car’s origins. It was originally built by the Budd Company in 1956 for use on the Denver Zephyr (Chicago-Omaha-Denver) operated by the Chicago, Burlington and Quincy Railroad. Two Vista Dome cars—the Silver Kettle and Silver Cup—were outfitted with a western "Chuck Wagon" theme. They included a diner/coffee-shop section seating 19 persons (shown in the image above), a counter with a dozen seats, kitchen, dome seating for 24 and a crew quarters.1 Passengers could enjoy light meals, snacks and beverages, or sit under the dome to watch the passing scenery. Amtrak made it clear that only certain cars met its standards. Amtrak assigned the cars to the San Francisco Zephyr (Chicago-San Francisco) before moving them to the North Coast Hiawatha (Chicago-Billings-Seattle) in early 1974.2 According to text on the back of the photograph, Amtrak had recently refurbished the car but remained respectful of its heritage: "A touch of the old West now rides with Amtrak’s Northcoast Hiawatha… [and is] a product of Amtrak’s continuing refurbishment program. Designed in warm copper tones, the new car features copper formica counter, rust tweed carpeting, walls done in barn board for a weathered, rustic effect and denim upholstery by Levi-Strauss." Amtrak retained the original wood carvings by Denver sculptor Lorn Wallace; in total there were eight pieces depicting the activities of a roundup out on the range. As new bi-level Superliner cars started to enter revenue service on western long-distance trains in late 1979, the older Heritage equipment was phased out. Amtrak retired the Silver Kettle and Silver Cup—and their unique interiors—in 1981. Do you remember riding on one of the "Chuck Wagon" themed cars? Share your memories with us in the comments section below. 1 Karl Zimmermann, Burlington's Zephyrs, (Mendota, Ill.: Andover Junction Publications, 2004). 2 Fred W. Frailey, Zephyrs, Chiefs and Other Orphans, (Godfrey, Ill.: RPC Publications, 1977).